Meathead Movers is here to take care of the heavy lifting for you on your move to Colton. Our clean-cut student athlete movers are ready to get you safely settled into your new Colton home. Nestled between San Bernardino and Grand Terrace, Colton provides all the amenities of a large city but still maintains its small-town charm. Don’t let Colton’s 16 square miles fool you; it offers plenty of things to do and see if you know where to look. From fun parks to shopping malls, Colton has a variety of amenities for the entire family. If you’re moving to Colton and want help with the heavy lifting, Meathead Movers can handle the job. Let the student-athletes on our Colton movers team work quickly and carefully to get you settled into your new home. With well-maintained parks and the Santa Ana River running along Colton’s southern border, this city offers beautiful views and a range of outdoor activities to discover. Both the Sam Snead golf course and the San Bernardino public golf course provide great places to spend your weekends. Closer to Grand Terrace, the Fiesta Village Family Fun Park offers arcade games, water slides, laser tag and go-kart racing for the entire family. If you want to enjoy the city’s offerings even sooner, our Colton movers can have you moved into your home in no time. Colton belongs to a wonderful school district and has elementary, middle, and high schools all within close proximity of each other. In addition, San Bernardino Valley College is just a few miles north of downtown Colton, providing a great place for your children to further their education after high school. For some outdoor recreation, visit Lytle Creek Park for a family picnic, or head over to San Manuel Stadium to watch the Inland Empire 66ers play minor league baseball. Whether you’re looking for a city with plenty to do or a great place to raise a family, you can get it all in Colton. 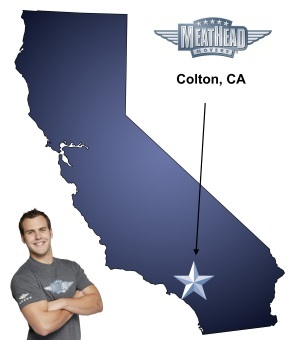 If you are considering a move to Colton, Meathead Movers is here to help. Our moving company specializes in local, long-distance, and commercial moves to, from, and within Colton. We also provide reliable packing, storage, on-site relocations, and our distinctive moving concierge service, which connects you with local service providers. We hire clean-cut student-athletes who attend Meathead University and abide by our smoke-free, drug-free policy. They are so dedicated to ensuring a fast and efficient move that they even jog while not carrying your items. a free no-obligation moving quote and see why we rank as the No. 1 moving company in all the communities we serve. Moving to Colton? Here are some helpful resources.